Showing 1 - 1 of 1 Products for Power Steering Pump Kit. Title: Borgeson - Power Steering Pump Kit - P/n: 800330 - Ford Power Steering Pump Upgrade. Fits Ford 289/302/351w. 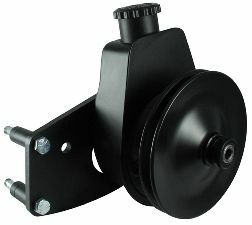 Includes Pump, Bracket, Pulley And Hardware. Painted Black. Borgeson manufactures complete Saginaw pump upgrade kits for Ford vehicles. Saginaw pumps run much quieter and are capable of generating more pressure & flow than stock Ford pumps. Pump upgrade kits include the correct pump, bracket, and pulley for your application. Will need adapter fitting to use original Ford hoses.